Ask fellow campers about "Cordes Junction Motel and RV Park" and nearby attractions. We stayed there in a 30' motorhome with tow vehicle. Site was gravel, pull through. Full hookups. Park is doing a lot of upgrades and will be expending. Restaurant pretty good and nice that it is on site. We would stay here again. We camped at Cordes Junction Motel and RV Park in a Motorhome. Stayed one night on our route 17 South from Flagstaff to Tucson. Check in was fast and Friendly!! 50 amp power was stable, pull through site was plenty long for our 42' RV plus towed vehicle. No cable, but there are so many strong over the air signals, it didn't matter. WiFi was reliable. We would definitely stop by here next time we travel I-17. We camped at Cordes Junction Motel and RV Park in a Motorhome. Went next door to 50's Diner. Didn't stay for dinner because we had leftovers in our RV, but went to the bar to have a drink and watch a little football. AWESOME service, generous pours and GREAT service. Good for an overnight stop along I17. Friendly check in, well placed utilities and strong Wifi. Far enough from the freeway to have little traffic noise. The diner had pretty good food and a nice atmosphere. We camped at Cordes Junction Motel and RV Park in a Motorhome. I stayed here for four nights. This is a combination motel, RV park, diner and bar--all on the same property. The RV park is small and simple. My site was only so so level but the utilities were easy to get to. There are some full time residents in the back of the diner and the overnighters are in a separate section. The diner is fun with its 50s theme and decor. I had lunch there and it was good. Did not use the bar but other people did--local residents. They were loud in the evenings --voices seem to bounce and echo off the walls in there. I was able to block it out with the vent above my stove for white noise. That being said, the bar must close early because by ten o'clock there was not a sound. Apart from that, the place is very quiet. No street noise, no highway noise. We camped at Cordes Junction Motel and RV Park in a Motorhome. Close by there is a Dollar General and the Shell station has a pizza place, Mexican restaurant and Subway. There is also a Chevron station on another corner. Day trips to Prescott (for example) with stops in the small towns on the way and back, including Dewey Humboldt, Jerome and Cottonwood. Also just a few miles down the road is the experimental community, Arcosanti. There are many other tourist attractions in the area that can be seen with a day trip. I concur with the previous rating. There is easy access to big full hook-up sites (non-dusty gravel). Since the pull-thru sites are not perfectly level, leveling may be problematic for some rigs. Our motorhome required some manual tweaking of the auto-levelers. The campground is excellent for over-night or 2-3 day stops. There were a few long-term residents in back-in sites and only one other rig in the ten pull-thru sites. It was fairly quiet. We did not use or need the showers, restrooms or laundry. I concur with the rating of the restaurant. Breakfast there was excellent. We stayed for two days and will stop again if in the area. We camped at Cordes Junction Motel and RV Park in a Motorhome. Rate reflects PPA discount. We stopped here on our way to Grand Canyon. Management extremely helpful and friendly. The sites are on the back side of the motel and truck stop - sounds ominous, but no lights or noise and beautiful views of sunrise over mountains. They have ONE bathroom, at the motel, and the shower attached is kept locked unless you request it. (Apparently they have had a problem with truckers using and messing it up.) We didn't need the shower so were happy just to hook up, eat and get on our way in the morning. But next AM, we opted to try the diner. OMG!!! What a great breakfast!!! And inexpensive. I had eggs, pancakes, home fries and bacon. Couldn't eat it all. Had leftovers next day. Same for wife. Though not scenic or a spot for a vacation, a wonderful spot to overnight. We would definitely stay there again. WAIT - FLASH - WE STOPPED A WEEK LATER ON OUR WAY BACK FROM GRAND CANYON. Yep, same great friendly service and THIS time we took showers. The manager said let me know when and she'd unlock. After dinner we went up and she quickly came out to open the shower room. She explained she had just gone in and cleaned it for us since she knew we would be wanting to take it on. Great Service!! Then, next morning, another great breakfast with leftovers. (Try the breakfast enchiladas--awesome.) Oh yes, a great spot. Main reason for lower score is the single shower and the utilitarian pull through spots. Also, they do not have a recycling program. But still, a great stop over. Hmmm, ought to try the dinner at the diner. We camped at Cordes Junction Motel and RV Park in a Motorhome. 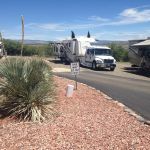 We wanted to stay in Black Canyon City, but the RV park we contacted didn't return our calls so we found Cordes Junction and what a nice find it was! The motel/RV park is very well kept. They have 10 pull throughs that they save for short timers. Their more long-term RVers are at one end of the facility and separated from the pull throughs. We were pleasantly surprised how quiet it was. There also is a very good diner on the property which is very nice since the town there doesn't have much for dining. The park is also easy access from the freeway. The Wi-Fi was OK, but as time went on, I had trouble hooking up to it. We didn't use the laundry or bathrooms which were up at the motel. The staff was friendly. If we are through that area again, we will stay there again. We camped at Cordes Junction Motel and RV Park in a Motorhome. Wow! What a find! Forget all the seedy motels with makeshift RV hook-ups you’ve seen elsewhere, this place is very nice! It has a combination of back-in and pull-through sites with mostly level gravel, full hook-ups. They have at least one site that allowed us not to unhook our 40’ MH and toad, although it was snug. The shorter sites are plenty wide to unhook and pull vehicles in side-by-side. The park is located behind a truck stop, but we heard nothing from the trucks because the motel is between them and the RV park, and it’s downhill a bit. We also heard no interstate traffic because of the hill. The truck stop offers pizza, subs, Mexican food, fuel, and convenience store stuff within walking distance, although on a cool, windy night, we chose to unhook anyway and drive there for dinner. There is a classic 50’s style diner in the RV park that is open daily for breakfast and lunch and for dinner on Friday nights. It has indoor and outdoor seating. The motel, gameroom, and restaurant, all have really cool murals. In the center of the property is a large, beautifully-landscaped picnic area with a gazebo and several picnic tables. They also have an on-site laundry with machines big enough to wash a bedspread and on-site propane. The rate shown is the PPA rate, but even at the full rate, it’s a bargain for what you get. If you want 50 amp, it is $4 extra. This great little park is a perfect base for exploring Jerome, Prescott, Montezuma’s Castle, and Sedona, without having to take the RV up narrow, twisty mountain roads, many of which have legal length restrictions. The very nice manager told us the owners had done a great deal of work over the past few years to get this park to its current state. It shows! He even told us about Arcosanti, a fascinating art and architecture community only a couple miles from the park and allowed us to check out a little late so we could visit. We stumbled on this park because we were tired and saw the sign at the exit ramp, but we will make a point to stay here next time through. We camped at Cordes Junction Motel and RV Park in a Motorhome. This wide spot in the road was sort of okay for the PA rate of $14.50. You don't want to pay full price. Only one unisex bathroom/shower for campers, really stupid. Sites are sloped, rocky, and short. Can't wait to leave. We camped at Cordes Junction Motel and RV Park in a Motorhome. This is a small park located on the same grounds as a motel and diner. The sites were cramped but clean. We had to unhook our toad for just an overnight stay, but the management went overboard to see that we had sites where we would fit. Convenient to the interstate, gas, and food. We camped at Cordes Junction Motel and RV Park in a Motorhome. Arcosanti is not far away. Not much to do there, but is dog friendly. Arcosanti is an outdated 70's commune making earthen wind chimes down a unmaintained 2 mile dirt road. Are you affiliated with Cordes Junction Motel and RV Park ?